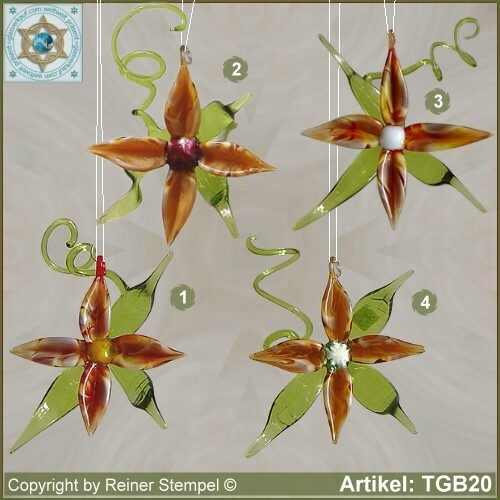 Our hand-made glass products glass flowers decorative blooms for appending made of Lauschaer glass are manufactured with attention to detail the nature according to perceived. They are very decorative highlights to the eye of the beholder. Therefore they are very popular as a Glass decoration (e.g. for festive decorated tables, showcases, etc.) and always a good gift idea. Because of your shining colors, they bring a beautiful atmosphere to any room, specially in inclement weather. You can the blooms to each other attach and make so decorative garlands. They are also suitable as a trailer for (e.g. light mills, Radiometer, glass balls, or flower arrangement).